There is nothing more effective to get me going in the morning than a nice, dark, rich cup of coffee. The combination of the deep bitter flavor, combined with the steaming hot cup is an immediate recipe for a good morning. Of course, when it&apos;s 90 degrees outside, a hot steamy cup of coffee doesn&apos;t sound as appealing as it might say when it&apos;s 50 degrees out. Iced coffee has long been the answer to this dilemma, making it a bit easier to imbibe in the hot summer months. I will say this much-I don&apos;t like iced coffee. The ice always melts into the coffee and waters it down far too much for my liking. My normal way around this is to add a shot of espresso to my iced coffee fixes to counter the water, and to drink it quickly. Coming to the rescue, as usual, Starbucks has come out with their Iced Blend. Earlier this month, they sent me a bag to sample. This blend, a combination of several regions, is very robust, deep and rich. Even chilling this and serving it over ice doesn&apos;t water it down. This is a coffee that I have been totally enjoying over ice, a perfect addition to my summer. 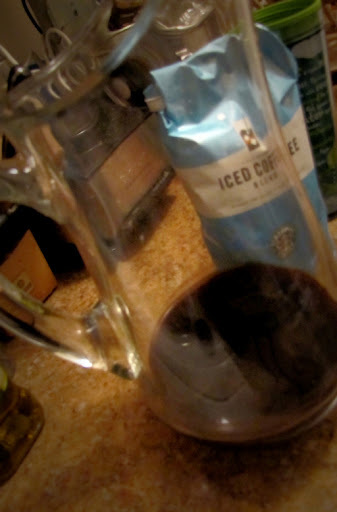 ohhh....you know I am the best iced coffee tester eva - I am on my way!